For a young guy to come in and tell me the field he wants, it shows he knows what he is doing, said Kohli. Visakhapatnam: Following India’s thumping win over England in Visakhapatnam on Monday, Virat Kohli was all praises for Jayant Yadav. The Haryana all-rounder, who made his debut and replaced Amit Mishra in the playing XI for the second Test against England, played a significant part in India’s 246-run win over Alastair Cook-led side. "The biggest positives are how the fast bowlers bowled and Jayant's debut. It's always priceless those contributions and it speaks volumes of his character," said Kohli. "I'm really happy for him. For a young guy to come in and tell me the field he wants, it shows he knows what he is doing," added Kohli. The all-rounder, who bowls off-spin and more than a handy batsman, did no wrong in his debut Test. The 26-year-old scalped four wickets in the match, including the three on the final day of the second Test, and chipped in with crucial runs with the bat in both the innings. His brilliant tag team effort with Wriddhiman Saha to run out Haseeb Hameed in England’s first innings was also one of the turning points in the match. Batting with Ashwin in the first innings, he scored 35 runs, not only did Jayant’s efforts do a world of good to his career, it also dashed England’s hopes of wrapping up Indian innings before the hometeam had crossed the 400-run mark. 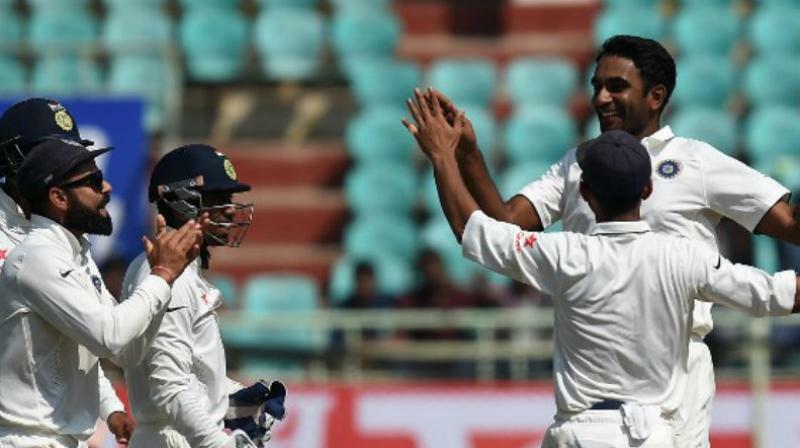 India eventually scored 455 runs in the first innings and the 64-run stand between Ashwin and Jayant played a big role in the same. Jayant, the batsman, once again proved his worth after India were reduced to 162/9 in the second innings. Jayant and Mohammed Shami put up a 42-run stand for the last wicket to take India’s lead past 400.